Experience a totally unique Similan Islands liveaboard diving cruise onboard a Chinese sailing Junk. 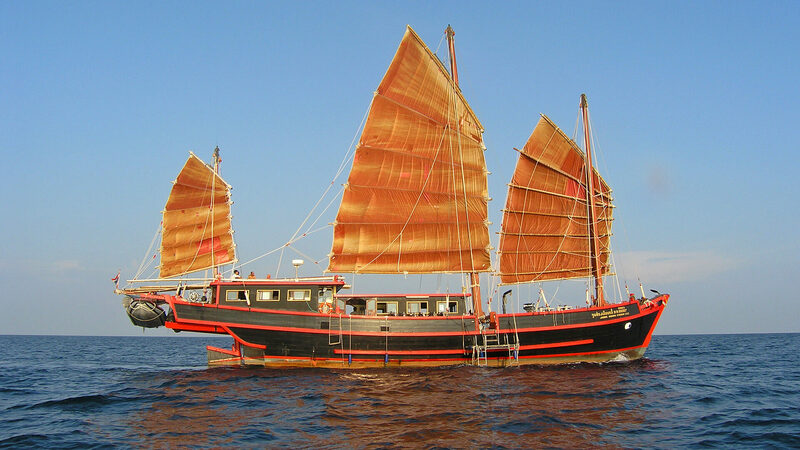 The Junk "SY June Hong Chian Lee" is one of the best known Phuket liveaboards, and carries a maximum of 18 customers to the Similan and Surin Islands for the diving experience of a lifetime. The June Hong Chian Lee has 6 cabins - two private double, two shared triple (can be booked as a double or twin) and two shared quads. The 5 day / 6 night trips allow The Junk to explore the Surin Islands. There are also shorter 4 night trips. A very large, comfortable boat and truly a different style of diving! All cabins have private bathrooms and individual control air conditioning. The spacious salon doubles as a deluxe restaurant, the perfect place to prepare photo or video equipment. Her immense deck allows divers to suit up in comfort, and relax between dives. The Junk is well known for her high quality of service – the experienced crew will make sure you are well looked after. 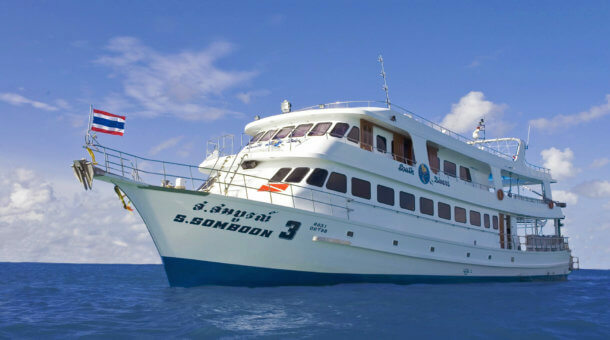 During the high season, The Junk makes some excellent 5 day / 6 night trips allowing more time to explore the many dive sites of the Similan and Surin Islands. The Junk is one of the few Phuket liveaboards that actually dives regularly in Surin, where the dive sites are less explored. 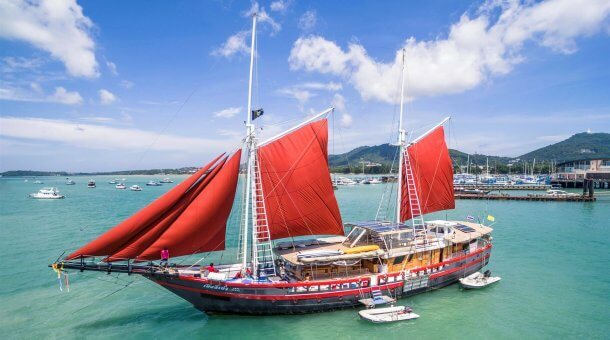 The June Hong Chian Lee is one of several junks built in Penang, Malaysia, and is a 30 meters, 140-ton three mast junk with 330 square meters of sails. Built in 1962 for charcoal transportation the June Hong Chian Lee was part of a small merchant fleet that traded up and down the coastline from Burma to Malaysia. She was mainly used to transport mango wood charcoal till 1985 then she was restored and redesigned for the first time to serve as a classic yacht. The June Hong is constructed mainly from a hard teak wood called Takien Tong. Extremely strong, the wood is used for the three masts that rise 23 meters above the deck – 28 meters above sea level. The trees cut for these huge masts date back over 300 years. According to legend, the June Hong has a murky past with stories of pirate cargo hidden beneath the charcoal. Secret compartments were often built deep inside the bulkheads, and there are old tales of junks dropping anchor beside coastal caves rich with gold ore and of pirates blasting out their booty and hiding it on board. Rental equipment is provided by Sunrise Divers for our divers on The Junk. Rental price is 500 Baht per day for a set (BCD/regulator/fins/mask/wetsuit) and 250 Baht per day for a dive computer. We have a large equipment room at our dive center with 30 sets of Aqualung BCDs and regulators and a large selection of long and short wetsuits, open heel and full foot fins. The Junk runs trips for 6 nights and 4 nights to the Similan Islands, Koh Bon, Koh Tachai and Richelieu Rock through the season from October to May. 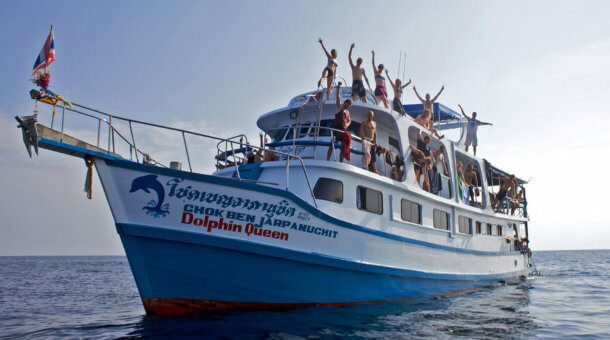 The 6 night trips normally also include some dives in the Surin Islands. Transfer by minibus to Thap Lamu Pier 20 minutes. Some trips depart from Patong and pick up in Khao Lak is not available. We will inform you of the correct departure and return ports when we reply to your enquiry. 09:00 Disembark at Thap Lamu or Patong. From Thap Lamu, transfer to Khao Lak or Phuket Hotels. From Patong, transfer to Phuket Hotels only. Note : This is an approximate itinerary. 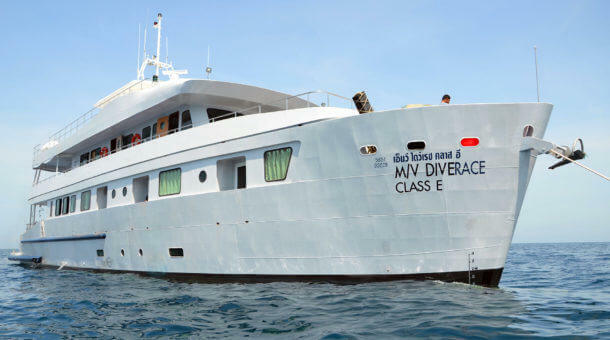 The 6 night trips include 19 dives at the Similan Islands, Surin Islands, Koh Bon, Koh Tachai and Richelieu Rock. Exact dive times will vary from day to day. There will be time for a couple of beach visits during the trip. Some trips depart from Thap Lamu and return to Patong, some depart from Patong and return to Thap Lamu. We will send a correct itinerary when replying to your enquiry.